These frosted glass hanging star lanterns with aged tin trim are a wonderful way to illuminate your rustic home decor. 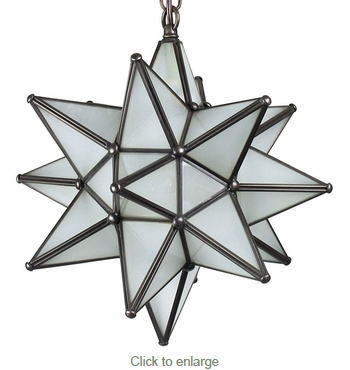 Each imported glass star light is handcrafted by artisans in Mexico in the classic Moravian style. This ten inch frosted glass star lamp will add an elegant feel to any room in your rustic or southwest style home.